Entering Katanga Canyon you are taken down a long winding path following the rapids, with dense trees and plants completely isolating the area from the rest of the park. This African mining village is built on an island surrounded by Congo River Rapids. There are bridges at both ends, allowing guests to enter from either Mutiny Bay at one end or Gloomy Wood at the other crossing a bridge that passes over the tunnel shared by the area's two rides. 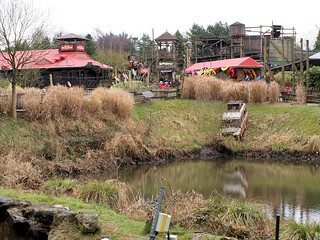 The area is designed to immerse guests and make them feel that they really had been transported to Africa, with lots of theming, including the abandoned Land Rover of a rather unfortunate explorer. Katanga Canyon was developed in 1992 alongside Gloomy Wood to house the new Runaway Mine Train, taking over the corner of Aqualand occupied by the Grand Canyon Rapids. The area was built on the island formed by the a rapids and the ride received a thorough re-theme to fit in, with it's old entrance path becoming the main area access. Since its opening the area has seen remarkably little change, other than the addition of the Katanga Cargo Games unit in 2007, which itself replaced a very short lived putting challenge.